Brenda wanted a jewelry display hung on the wall outside her bathroom recently. Since it was pretty heavy, we wanted to engage studs with our fasteners, if possible. Gathering everything we would need for the task, including the stud finder, we went to work. I popped the 9- volt battery into the unit and set out in search of some solid wood. This stud finder has been in our family for a long, long time. While it’s not the modern unit that finds steel studs, electrical wiring and water pipes, it’s pretty consistent most of the time. Most. But not this day. When the old unit kept giving me wacky, unreproducible results, I figured the finder had outlived its usefulness and needed to be replaced. A quick search on HighlandWoodworking.com showed me that Highland doesn’t stock them. I looked at a few other sources, read a bunch of reviews, and sent an email to Steve Johnson to see which one he uses. He said, “None of them work,” which meant I was going old school. First, I measured where the framing should be, but rapping knuckles on the wall, listening for a “hollow-solid-hollow” sound told me I could forget about studs on 16″ centers. It’s a narrow wall and an HVAC plenum is behind it, which led me to believe it was built “unconventionally.” Or, maybe the “Unhandy Handyman” was here on that day of construction. Plan C was to start drilling holes in search of studs. However, if you do this, you want your holes as inconspicuous as possible. Enter the lowly coat hanger as stud finder. 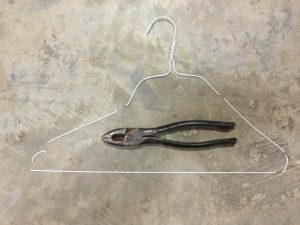 You can get at least 3 “drill bits” out of a single coat hanger, depending on what length you need. Coat hangers are soft. You can cut them with lineman’s pliers, or even the shear in your slip- joint pliers. 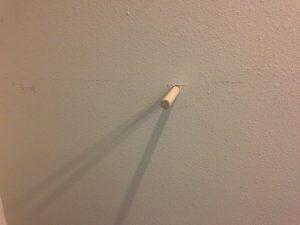 Since I was going through 5/8″ drywall, a short piece was good. Still, you need enough length to be able to feel the difference in resistance between air and wood. Choose your location. If you have an idea where the studs are, start as close to one edge as you can. Also crucial, if the item you’re hanging can hide the holes you make, you’ll be saving a step: no filling necessary! Next, define the edges of the stud by feeling with your homemade drill bit. Ideally, you’d like to be exactly in the middle of the stud with your hanging screw. When I was in the beginning phases of hanging this floating shelf, I needed to locate studs exactly, so that I could have our dowels perfectly centered. The stud finder got us close, and tiny coat hanger drill bits fine-tuned the edges. The little holes are hidden behind the floating shelf. Did I mention that coat hanger drill bits are free? 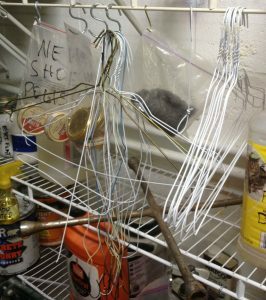 We switched to mostly plastic coat hangers about 15 years ago! Lately I’ve been hoarding all the metal ones for use in machine set up because I’m too cheap to buy proper tools sometimes and not others (see my Lie-Nielson Planes and saws!) 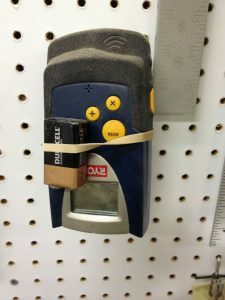 – I’ve been hearing a lot about using magnets to locate studs lately – Do you have an opinion? I think about making a simple tool with plenty of strong magnets and giving it a shot.